We’re all pretty impressed by the performance of Lewandowski in the game Bayern Munich vs. Wolfsburg from last night. In just 9 minutes he crushed Wolfsburg with 5 overwhelming goals, right after he got off the bench. And well, that’s also the inspiration of today’s blog. So, set your timer, get off the bench and start reading, because we bet that we can crush these 5 SEO goals into your head within 9 minutes, to make sure you’ll win in the search engines. Of course, yesterday was all about Lewandawoski, but today it’s your day to score on the internet! Not many people can say that they’ve a SEO model named after them, but after today Lewandowski is one of them. But enough for now about soccer, it’s time for the real stuff. This SEO goals model can be used in different ways, in the first place it can be used as a directive for your SEO goals, while writing your SEO strategy. If you make sure that you think about all the circles that you have to cross to come to the inner circle, you’ll be able to make a more clear path right to your main goal, whatever that might be. Secondly, if you combine the guidelines with your own goals and measure points (KPIs), it also can be used as model that helps you to overview your results and with that your weaknesses and strengths. It works from outside in, always through the shown circles, so if you can’t get to the inner circle, this model will help you to find the wall that blocks the success of your SEO strategy. If you’re trying to achieve a goal in the conversion circle, it’s possible that this goal is blocked by something in the ranking or traffic circles and by analysing each you’ll be more likely to determine what goes wrong. To clarify the meaning of the different circles, we’ll discuss them one by one. 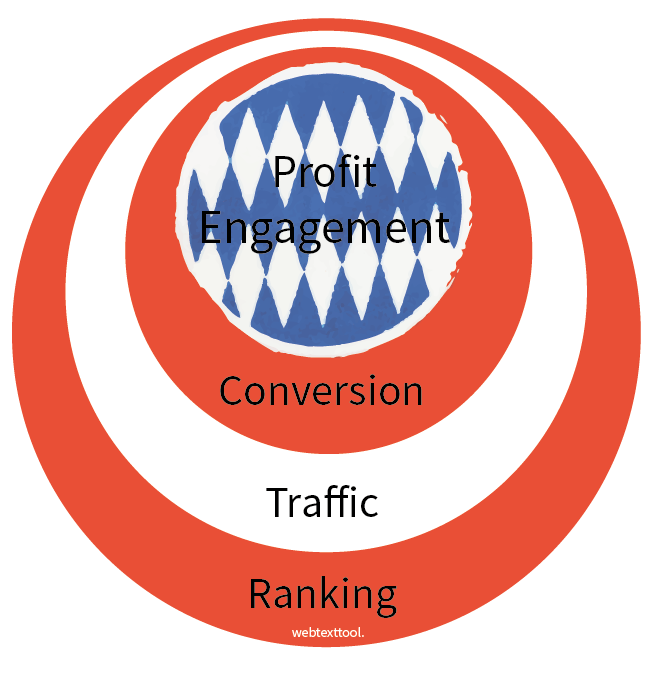 The outmost circle in our SEO goals model is ‘Ranking’. You can choose ‘Ranking’ as a goal for your SEO strategy to get higher in the search engine rankings, but most of the times this is only the first step to SEO success. How do you work on your SEO ranking? That’s not that easy to say. Search engine rankings are influenced by many factors and Google and other search engines try as hard as they can to keep these factors a secret. That’s why it’s hard to determine how you can get the best out of your ranking goals. If you want to know more about how to influence search engine ranking factors, you should take a look at our previous article. Our big SEO brother Moz publishes their view on search engine ranking factors every year and their report, made by 150 experts in the field, is pretty convincing. Also one of the things you can do to influence your ranking is optimizing your web content. That’s where Webtexttool comes in to help you out. If you’ve completed the outmost circle, it’s time to take things to the next level. The next SEO goal could be to increase traffic on your webshop, blog, website or whatever you’re writing for. If you manage to rank higher in the search engines, it doesn’t mean that you’ll get more traffic immediately. The pages that rank in the top 10, or even better in the top 5 have the best chances to generate traffic. An important element to increase traffic on your website is to think about your title tag and meta description. These two elements are the cover of your webpage and just like with books, the cover sells the content. If you want to know more about writing an attractive cover for your webpage, you should take a look at our article about meta descriptions. Traffic on your website is easy to measure with tools like Google Analytics and many others. You’ll not only measure the number of visits to your website, but also the bounce rates, combination of new and returning visitors and many other factors. By analysing these factors you can measure the results of multiple pages to determine whether you’re doing the right thing or not. This information could also be the starting point while forming your traffic goals. For example, if you see that your bounce rates are pretty high, you can decide to set the goal to lower them in a specific time period. By analysing Google Analytics you’ll be able to see where these increasing or decreasing results come from. So conversion has everything to do with users who take a desired action. This could be buying something, like explained in the example above, but depending on the main goals it could mean many different things. For example, subscribing to the newsletter, trying out your tool, downloading your whitepapers, following you on Facebook, sending a mail to your support system or whatever. So in this circle, a main goal could be; “Get 15 new subscribers to our newsletter every week for 3 months, ending on 14 April 2016”. In this case you might want to give some more background information on the ‘Why’ and ‘Which’ elements of the 6W’s; explained in the ‘SMART goals’ topic on the end of this page. You can’t convert viewers that you don’t have into the actions that you want them to take, so if you want to get these 15 new subscribers, you might need to make some changes in your ‘Ranking’ or ‘Traffic’. This way you can see exactly why these elements are so connected with each other. In the inner circle you can find two terms; ‘profit’ and ‘engagement’. We decided to put these elements on the same level in the SEO model for the reason that some of the readers of this article don’t write for profits at all. And besides that, the main goal of most organizations might be profit but not every SEO strategy does have to share this same goal. Although it’s also possible that you generate profits by changing your engagement goals. In our opinion, ‘engagement’ can be a very useful alternative to ‘profit’. If you engage yourself to someone or something, you’ll accept them, promote them, respect them and after all you’ll develop a relationship. And this relationship is exactly what you need. It’s possible that your webshop visitors don’t decide to buy your products the first time they visit your website, but they do subscribe to your newsletter. Then a goal of engagement could be to make these subscribers come back to your website and to activate them to convert in different ways. As you’ve seen, it’s hard to set hard goals for engagement, because engagement has a different definition in the eyes of every organization. If you’re willing to set goals in this category, you should think about how to measure these soft scores like; ‘trust’, ‘appreciation’, ‘respect’ and ‘acceptation’. If you’re a blogger and you don’t write for profits at all, engagement can be the final destination that you constantly want to expand. Your overall success will probably be measured in the number of engaged people to your blog and in this situation you could make it very measurable, for example by counting the number of followers. The last element in the inner circle is ‘Profit’. It sounds like music into the ears of many online organizations or webshops. The difference between your investment and the returns of it. Although this might be the final destination, it’s important that you don’t skip the goals in the other goals. This element is in the middle of the SEO goals circle because according to us, the goals for the other elements can help you to grow in this inner circle. Goals in this inner circle mostly have something to do with Return of Investment (ROI), cold hard cash. It’s okay to go for cash, but don’t let your goals other get overwhelmed by this one. They are all just as important. It’s important that every goal that you determine is formed by the SMART-structure. This structure makes sure that you form goals that are valuable and don’t give false or incomplete information. SMART is an abbreviation for Specific, Measurable, Attainable, Realistic and Timely. What do I or do we want to accomplish? Which requirements and constrains do I need? Why do we do what we do? What’s the purpose or benefit for accomplishing the goal? If you’ve answered the 6W questions you’ll be able to form a pretty ‘Specific’ goal. The next step is to make your goals ‘Measurable’. You probably have mad a start with the ‘When’ question, but if you’ve got an engagement goal like; ‘My blog’s engagement with the target audience has to increase with 5% by the end of 2015, compared to the begin of 2014’ it might be necessary to make it even more measurable. Because what’s the definition of engagement? In this case you have to add more measure points, the so called KPIs. Write down what you’re going to measure to determine if your goal has succeeded, for example; 10% more Facebook followers, at least 30 comments on every post of whatever. The next step is to make your goals ‘Attainable’. Sometimes you have to do some preparation before your goals are attainable and you’ve got to figure out what to do to achieve what you want to achieve. You’ll need to develop skills, knowledge, attitudes and financial capacity to reach them. If you find out in the process that your goals aren’t attainable, you should think about ways to adjust them to your new findings. Also if you find out that things are going way easier than you thought, you can decide to expand your previous goals. But, now that we come to the next step, your goals need to be ‘Realistic’. You can’t buy 200 LCD televisions for 2 Euros or walk 200 miles in 1 minute. Always keep in mind what your budget is and which knowledge you poses. If you don’t form realistic goals, you’ll find out quickly enough that your goal isn’t working and this can kill your spirit. It’s good to push yourself to the limit, but don’t step over it! Last but not least you should think about is ‘Timely’. This is something that you’ve seen before in the ‘When’ question from the 6W’s but it’s something that people often forget. You can’t measure anything if you don’t know exactly what time you’ve got to achieve your goals and to do specific activities that influence your outcome. Try to make a realistic prediction on what time you need to finish your goals. Use the SEO goals model your own way and we hope that it helps you to form SMART SEO goals that will help you to score on the internet! 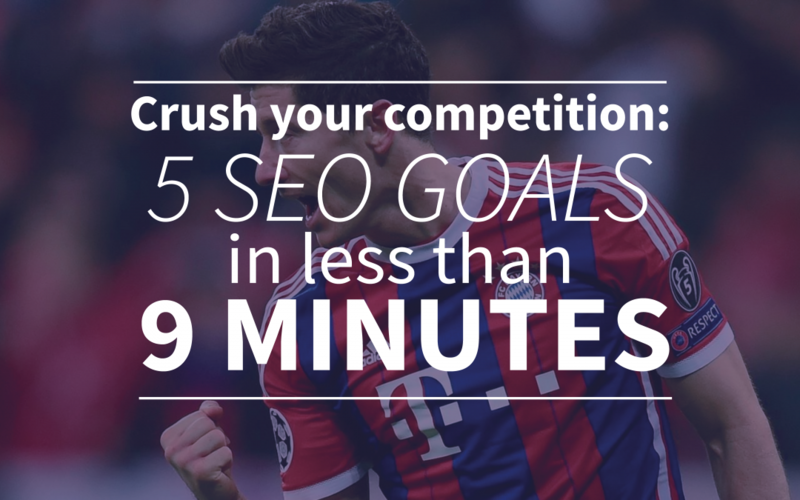 If you have any ideas about how we could improve or supplement our ‘Lewandowski SEO goals model’, please let us know. Also if you don’t agree with us at all we’d love to hear what you think about it! If you want to start realising your SEO goals, you should take a look at our free trial account of webtexttool. This way you could get started right away! This article was inspired by Stephen Pitts.